As you know last week I came back from Cote d’Azur. I already wrote about my short stay in Nice and where I stayed this week. After Nice we had a two day stay in Cannes, so before I write about what we did there, I wanted to show you first where we stayed. 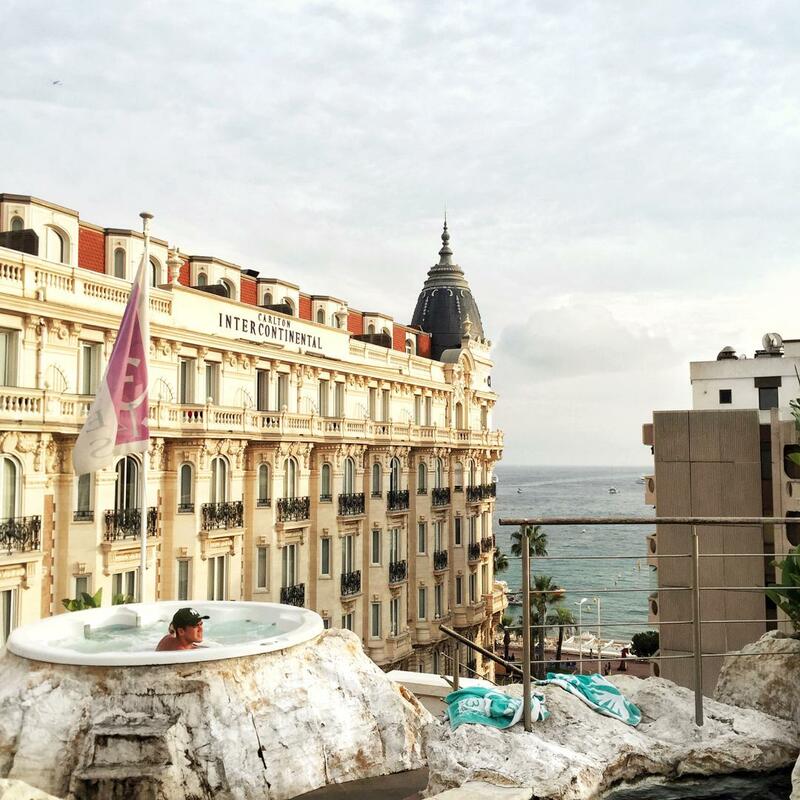 3.14 Hotel in Cannes is a bit of a celebrity on Instagram You might have seen some photos of people chilling in the jacuzzi with an epic view. Well I wanted to see it for myself. Before I share the photos I wanted to share my opinion on this hotel because I don’t want it to get lost between the photos. I was quite impressed with the design of the hotel, I thought it was very beautiful and colourful which is a breath of fresh air after you visit hotels that have not been redone in decades. *The staff was nice and they spoke english – however not too well, so some more complicated conversations were hard to manage. *Dining options were various mostly Spanish tapas which I enjoyed very much – however there is always a downside, and unfortunately for me it was the breakfast. This is the second hotel in France that had very limited options, however unlike the one I stayed in Nice, this one did offer a’la carte breakfasts in the room. Their scrambled egg at breakfast was more of a milky stew than an egg to be honest, it was hard to look at it, and quote fascinating. *The bath in the room was leaking – I am unsure if the hotel knew that, but I was worried because I didn’t want the water to ruing the lovely carpets in that amazing bedroom. I did tell the reception so I hope it doesn’t cause any damage. *Amazing Pool and a Jacuzzi on the rooftop! – The only problem is, if there are a lot of guest, there will be a lot of people trying to get in to the jacuzzi, and you might miss out, like I did. After that it only get’s better. Each floor is designed to represent a continent Everything is then decorated to spread the vibe of a certain place. Our room was on the second floor, which represented Africa, and our room was the suite. I do love a good suite. Everything was is warm blues, purples and pinks with hints of gold which is a little bit of Moroccan style. I still haven’t visited Morocco, but really thinking about it after this experience. When you first enter the room, this is what you will see. I can’t complain. This is such a great size suit. To be honest, I rarely ever use the whole space as I am busy exploring, but this is a very spacey room with a lot of soul. From the living area there is an entrance to the bedroom and the bathroom which are placed in the same space. That is where I spent most of my time. The bed is soooo soft and comfy, I spent most of my time just relaxing in it. When you first arrive it is decorated with African inspired pillows, but in the afternoon the maid comes and makes your bed. Bedroom was also a place where I made some tough fashion choices. This was the view from our room which was really interesting …It is a quite different from the regular views you would expect. Nevertheless – quite nice. You get to watch people passing by with shopping bags, local people walking their dogs, some joggers and also the yachts! There are two dining areas. One is for breakfast which is located on the ground floor and has the inside and the outside. It is designed as a circus, so it is also very colourful and bright. Everything at the breakfast is self-service, including the coffee. The best part is – of course – the rooftop with the pool and the tapas bar. We spent a lot of time here drinking and eating, but I will share those photos with you in my upcoming posts. Have you ever been to Cannes? Where did you stay?